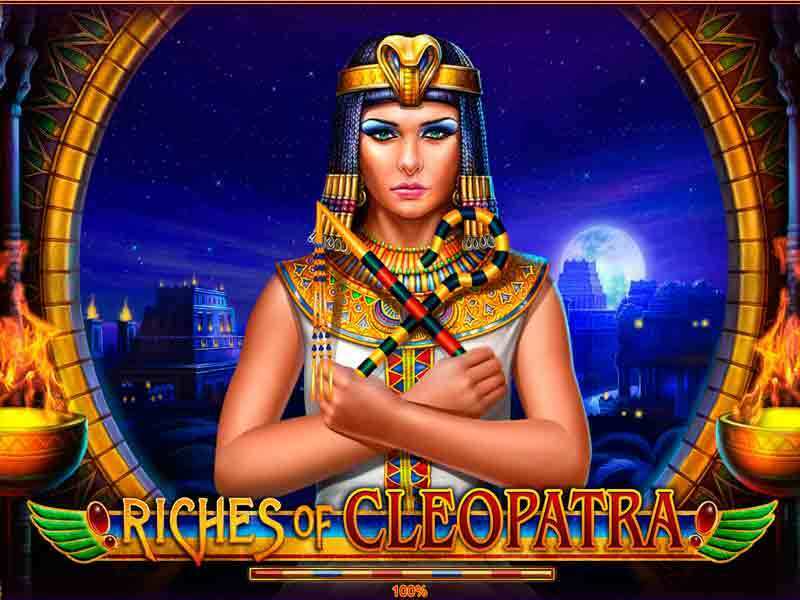 Riches of Cleopatra is a video slots game developed by Playson Software that has 5 reels and 20 pay lines. This Ancient Egypt themed game is inspired by Cleopatra and is set in a tomb. You can play this game online for free or at any online casino for real money. The ‘Bet’ arrows are to set your coin size. The coin size ranges from 1 to 500. The ‘Lines’ button sets the number of active lines. The more lines you play, the higher your chances of winning. The ‘Spin’ button turns the reels. ‘Autoplay’ will spin the reels automatically for a given number of times with no interruption. The ‘Gamble’ button will start the gamble feature. Symbols available in this game include the scarab, the Eye of Horus, the crook, the flail and the poker symbols 9, 10, J, Q, K and A which are of a lower value. The scarab symbol rewards the player with 400 coins while the god symbol can get you up to 750 coins. The wild symbol in this game is Cleopatra. This symbol can substitute for all other standard symbols except the scatter symbol. The tomb of Pharaoh acts as the scatter symbol. When 2 or more of this symbol appear you get more coins. 2 symbols get you 2 coins, 3 symbols pay 5 coins, 4 symbols pay 20 and 5 symbols pay 100 coins. 3 or more of the scatter symbols will trigger the bonus round. 3 or more scatter symbols unlock the feature that awards you 15 free spins and a multiplier of 3 times. More free spins can be triggered within the bonus round. If you land 4 of the Cleopatra symbols, you get rewarded 2000 coins, 5 symbols, on the other hand, get you a 10,000-coin jackpot. This feature can be activated by clicking on the button after any win if the player is interested in doubling their winnings. Each round has 2 bets higher than the previous one. Choose one of the two boxes; one contains the prize which means you win and the other is empty which results in a loss and will return you to the base game. You can play this up to 5 times consecutively. The Return to Player rate is about 95.75%. The free spins bonus round and the 3x multiplier make this game more interesting and increase your chances of winning. This medium variance game developed by Playson is some of the best quality features in terms of graphics and sounds making the gaming experience worthwhile. Discover the hidden treasures of Riches of Cleopatra online at recommended casinos such as Jackpot City, Gaming Club Casino, and Ruby Fortune. There are many other games available from Playson you can play online for free. Some of these games include Treasures of Tombs, Aztec Empire, Thunder Reels and Fruits of the Nile. 0 responses to "Riches of Cleopatra Slot"